There are many ways in asp.net for generating RSS file.you can use string concatenation,loop iteration or using more advanced techniques you can Use LINQ-TO-XML for creating xml document for RSS feed. i was searching a in SQL server by which i can generate RSS using T-SQL query. SQL Server is shiped with many new function and operators which help us to generate XML from SQL server. There are many options Like RAW Mode ,AUTO Mode and EXPLICIT Mode. auto and raw mode can be used for simple xml tag generation ,while Explicit mode is vary powerful mode to generate whole XML documents. 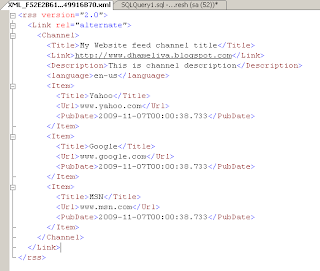 I Will show you the code how to Generate XML file for Rss Feed. and Here is The code which will give you content as xml which can be written Feed file. When you look at Tag and Parent Column you can easily judge what actually happening in this query.